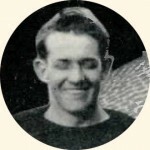 Roy Adkins was a substitute at left guard in four games for Staley in 1920. Since none of those games were against recognized American Professional Football Association teams his playing professional football is not found in any NFL football archives. In addition to his pay for working at Staley’s that year, he received a player bonus of $370.00 at the end of the season. He was also present at the Staley player reunion in Chicago in 1956. In 1922 Adkins and Gepford were recruited to play sports for Bethany College in West Virginia. [The Bethany College coach had been the high school coach of one of Adkins’ fellow Millikin linemen.] According to Hank Gill, J.M.U. football teammate, fellow Bethany grad and later long-time Millikin coach, Bethany did not care about athletic eligibility at that time and players received room, board, tuition and books. “It was a lot more than the big schools were doing and no one much cared what was going on,” Gill remembered in a 1975 interview. Adkins played football at Bethany and graduated in 1924. After graduation, Adkins returned to Central Illinois and coached for a few years at Monticello and Farmer City high schools before going into business. His father Charles at this time was a U.S. Congressman from Illinois. Roy married Harriett Elizabeth Morris in Shelby, Ohio and they had one son, Roy Thomas Adkins. Roy Sr. eventually became the top official for the North American Cement Corporation in NYC and for many years served on the Board of Trustees for Bethany College. He died of a heart attack at his home in Montclair, New Jersey and was buried in the Shelby-Oakland Cemetery in Shelby, Ohio.